Flex Core 8 is an innovative design, compact and portable, resistance and cardio training exercise unit that is fun and easy to use for quicker results in fat burning, core toning, overall body sculpting and firming, midsection shaping, calorie burning, for your upper body- triceps, biceps, shoulders, chest, core and lower body- different leg muscles, to lose weight and tone and strengthen muscles simultaneously with 8 muscle building resistance plus cardio exercises, and all in one. It measures 22.5″ diameter x 20″ height when fully opened, is compact and has a foldable design which makes it portable so you can take it anywhere you go and with its adjustable resistance you can adjust it to what you can handle so you can do a full range of motion reps that will feel like someone is actually spotting you at the gym. Like with any fitness equipment or workout program the results you achieve will depend on each individual and their efforts as well as what their nutrition is like- how well they eat, so nothing is guaranteed here and you can’t blame the machine if you don’t get what you want out of this but if you use it regularly and in a correct manner it may easily replace your gym workout if you are not an advanced gym goer or body builder. 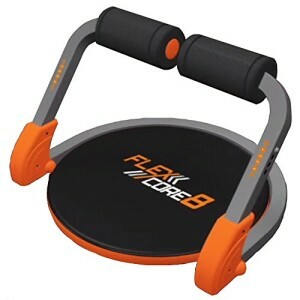 Having said that Flex Core 8 is suitable for both beginners and advanced as the resistance is adjustable and by the use of dual training impact of both lowering and raising movements. It is a solid product that is built to last- from commercial grade heavy duty steel, for quite many years as long as you are not too rough on it. Although it is a whole body workout device that you can work your upper and lower body, the primary reason for using it is your core area- toning your abs, reducing your waist and ab size- working on your upper, middle and lower abdominals and strengthening your lower back and developing a better posture. It has a circular base and two adjustable tension pedals that you can do a few exercises on it, including crunches, sit-ups, pushups, bridges and cardio cycling in different positions- leaning on it from back or front, seated in a chair, laying across it and you are promised the maximum possible results very quickly, as long as you’re using it properly and regularly while following a healthy diet then you can expect that overall healthier looking and more toned and sculpted body in a few weeks time. Although this is quite a new product, judging by the reviews online and the competitive price level, we feel that this may be something that a lot of people can benefit from. In the box you will find the Flex Core 8 Total Body Trainer, Fat Burning/Muscle Sculpting Exercise DVD, Exercise Guide and 21 Day Burn Fast Meal Plan For Women and Men.